Millions of seniors are food insecure in the United States, meaning that scores do not have access to enough food at all times for an active, healthy life. What makes food insecurity an even more pressing issue is its association with a wide array of negative nutrition and health consequences. 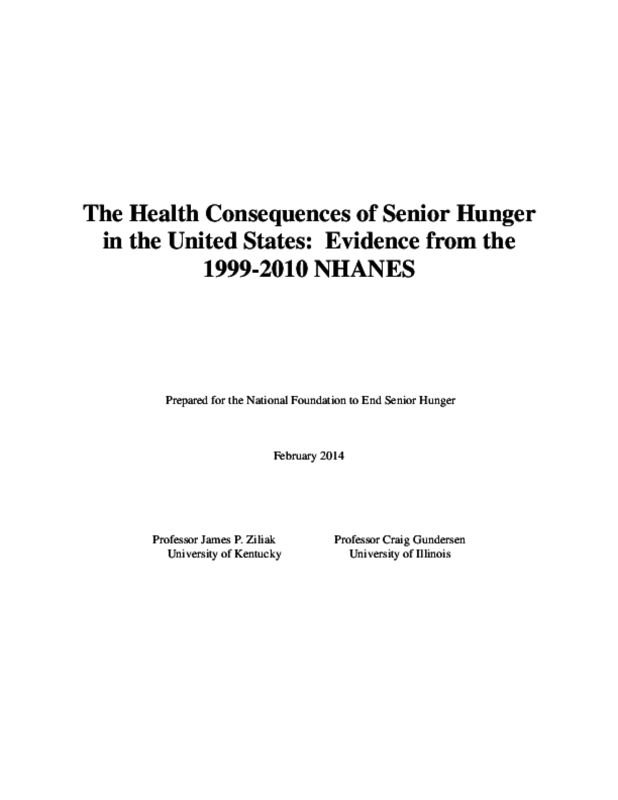 In earlier reports on food insecurity among seniors it was documented that food insecure seniors, even after controlling for other factors, were at higher risk of experiencing negative nutrition and health consequences than food secure seniors. In this report, we build on those earlier findings in three main directions. Namely, we add in several new health outcomes; we use four more years of data ; and we examine how trends in health and nutrition outcomes among food secure and food insecure seniors have changed over the past decade. Using data from the 1999-2010 National Health and Nutrition Examination Survey (NHANES), we considered the following outcomes related to nutrient intakes: energy intake, protein, vitamin A, vitamin C, thiamin, riboflavin, vitamin B6, calcium, phosphorous, magnesium, and iron. The set of health outcomes we analyzed were diabetes, general health , depression, diabetes, ADL limitations, high blood pressure, high cholesterol, congestive heart failure, coronary heart disease, cancer, reports of chest pain, gum disease, psoriasis, asthma, having had a heart attack, and a self-report of gum health. Copyright 2014 National Foundation to End Senior Hunger.